The 2019 edition of the Vodafone Ghana Music awards is here with notable musicians like Shatta Wale, Stonebwoy, Kuami Eugene, King Promise,Sarkordie,Joe Mettle making it to the list of artiste of the year. With 20 years experience in putting together this exciting event, the organizers of the annual Vodafone Ghana Music Awards, Charter House Ghana has proved that indeed they have drawn proficient lessons and tact from happenings of previous years. It is worth-mentioning that strenuous efforts were put in this year's nominations which has obviously contributed the positivity in response to the announcement of nominees from stakeholders in the music industry and the general public with a few pointed errors. With a total number of thirthy-one categories, most people will be focusing more on the artiste of the year. Eventhough six artistes have been nominated for that category, it seems easy to predict who is likely to win. In the run-up to this year's nominations even before the official announcement by Charterhouse, it was obvious that the artiste of the year will be between Stonebwoy and Kuami Eugene with Sarkodie, Shatta Wale, King Promise and others being nominated just to add to the list. Stonebwoy is my best bet though Kuami Eugene is also qualified to be crowned as artiste of the year. The Bhim Nation leader Stonebwoy, born Livingstone Etse Satekla has received nine nominations as the Rockstar Kwame Eugene bags ten. I am fully aware of the fine tunes and rhythms recorded by Kuami Eugene under the year of review and do agree with key industry players like Nii Offei Dodoo,blogger/publicist that Kuami Eugene comparatively have grown from the reality show to become a great commercial musician. However, is worth-noting that Stonebwoy has built an enviable brand with his Bhimnation squad which has undisputably been accepted as a trademark in the Ghanaian entertainment industry and has equally added more flavor to the ears of music fans. He has projected Ghana with international appearances on several musical platforms . Stonebwoy's songs made huge international waves with super bangers like "Top Skanka", Tomorrow ", "Kpo k3k3 and some other hits. 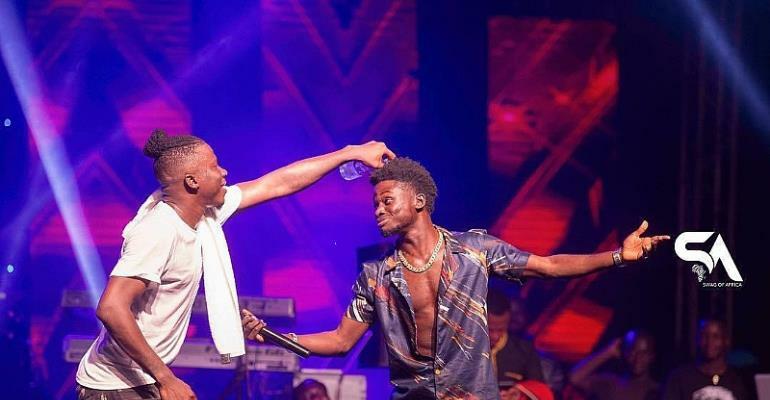 The Rockstar Kuami Eugene has also become a household name in the country so far as quality music is concerned. With his soothing voice, the Lynx Entertainment youngster has really worked hard under the year of review with hits like "Wish me well", Walaaahi, among others and deserves maximum respect for achieving such heights within a short while but Stonebwoy may "beat" him with experience and exposure in the artiste of the year category. I think no matter who is chosen as the best artiste of the year 2019, Stonebwoy and Kuami Eugene have been outstanding and must be 'hailed' for exhibiting consistency in excellent outputs with regards to the quality music they produce with passion. Based on the procedure outlined by the organizers, I believe Charterhouse will deliver the most original artiste of the year without any "confusion". I wish Stonebwoy and Kuami Eugene well.